I stayed a couple of weeks in Marrakech a while back and one of the main things I was worried about was catching some things that was going to ruin my guts and therefore my holiday. With that in mind I sort of stuck to any food that was either baked or boiled to within an inch of its life, or chips! That didn't leave me with many options, so much of what I had was cooked as a Tagine and luckily my stomach stayed intact. 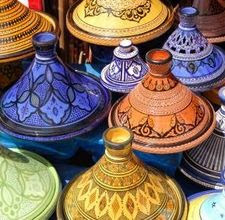 But to be fair, the tagines within the tourist areas of Morocco were pretty dull and tasteless. So much so, that whatever you ordered, it tasted much the same. So now back in my home country I wanted to give a tagine recipe a go and see if I could do any better - surely the locals wouldn't eat this stuff. And to be fair - when I was there - the locals didn't! To begin with, heat up the oil in a large non-stick wok or heavy based saucepan. Then cook the onion over a low heat for a couple of minutes - don't over cook! Add your chosen meat until it has browned off, then add all of the remaining ingredients except the couscous and coriander. Now bring to the boil then drop the temperature so that it simmers for a couple more minutes with the lid on. Remove the pan from the heat and add the remaining ingredients and stir in. Cover the pan of wok once again and leave for a further 2 to 3 minutes. The tagine is now ready to serve with a mixed herb salad or seasonal vegetables and bread. This is enough to serve 2 - 3 people. 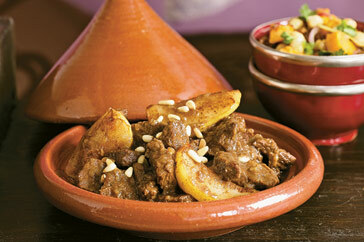 As the heading suggests, this Tagine recipe can also be made as a casserole for 4 people. In a change to the first recipe you are going to need some more ingredients. This time you will need to use 450g of lean beef, lamb or pork braising cubes, 175g chopped apricots and 450 ml of stock - plus the remaining ingredients. Place all of the ingredients into a large oven proof dish except for the coriander and the couscous. Place in an oven pre-heated to 180 Celsius - gas mark 4 - and cook for between 1 1/2 and 2 hours. 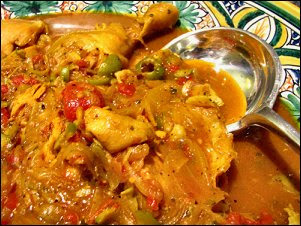 When cooked, removed from the oven and add the couscous. Mix well in, then cover with a lid and leave for a few minutes. Now add the coriander and serve.